The gorgeous, Jessica Alba, was spotted wearing our Dailylook Exclusive Midi Skirt in Navy while walking with her daughter. From the red carpet to errands, this woman is always looking her best! Walk In Wonderland Fashion Blogger, Sheryl Luke, was spotted in the DL Exclusive Tie Bodice Jersey Maxi Dress. Worn with a great denim jacket and casual sandals, this is the perfect look for that in-between season where summer meets fall. Stunning Victoria Secret Model, Alessandra Ambrosio, was spotted wearing our DailyLook Exclusive Tie Bodice Jersey Maxi Dress. Even running out the door, Alessandra looks absolutely stunning! Love. Spotted: Kendall Jenner In DailyLook! Kendall Jenner looks stunning in our exclusive DailyLook Crocet Bodice Maxi Dress. The backless detail and light, flowy skirt is the perfect dress to wear all through summer and into fall. 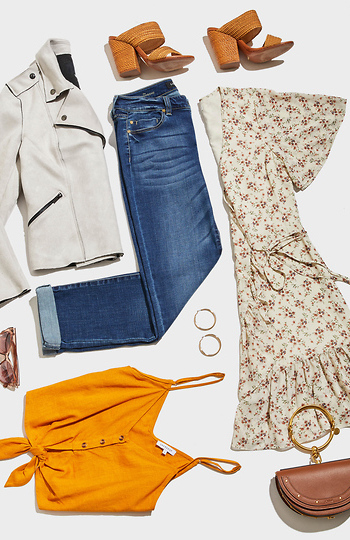 Pair it with boots to give the boho-inspired look a little bit of edge. Read on to shop the look! Best known for her roles in The Phantom of the Opera, Poseidon and Beautiful Creatures, actress Emmy Rossum was spotted in our favorite Daily Look Exclusive Pleated A-Line Midi Dress in white. Stunning! Reese Witherspoon is spotted in the Monica Rose Lucia Crop Top and Monica Rose Charlie Skirt from some of our favorite folks over at Lovers + Friends. Read on to shop the look!